A good while ago as part of their Olympics sponsorship promotions I got given this twin pack of bars on the street in Birmingham. Despite feeling a little bit sad that the people handing the bars out had to explain to every single person that they may contain nuts I took one and stored it away, forgetting about it. Eventually, one day at work, I'd run out of my biscuits and decided to give them a go. They are a lot tougher and crunchier than I expected! 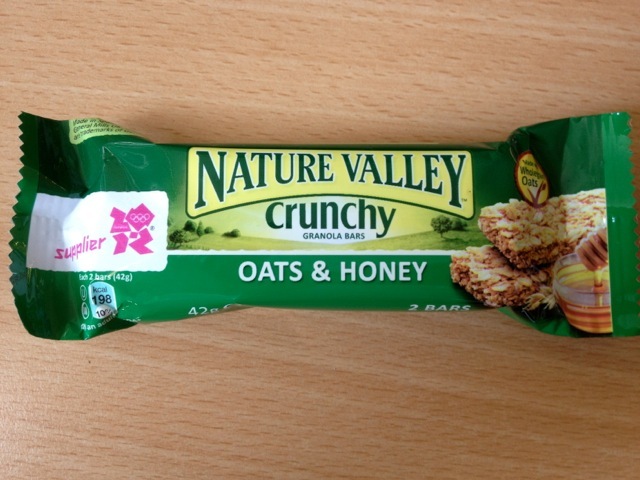 Essentially it's a granola style bar but really compressed so it's almost like a rivita crisp style. The flavour is nice and oaty but really quite mild, and the experience is very dry so you'd not want to eat these out and about without having a nice flask of tea handy. They do feel quite healthy and probably aren't full of too many poly-un-bad-things despite their fairly high calorie count (for a 'healthy' snack anyway), but if you are doing exercise up on the hills of Britain or just doing some running like the people on the telly then an extra 200 calories is nothing. I must admit I do really like these bars despite agreeing they are a little bit dry. My favourite is probably the maple syrup flavour and the 'oats and more' varieties are quite nice too-they do a berry one and a hazelnut one which I have tried. I find they are very filling and not as sugary as other cereal bars which makes a change! Not the tried the maple syrup ones, but I have picked up a pack of some new blueberry Special K breakfast biscuits... I'll be writing about them shortly.